Wash and dry all the strawberries. The have to be completely dry for the chocolate to stick nicely. Mix chocolate and Crisco in a 1 cup glass, measuring cup and microwave for about 25-30 seconds at a time and stir. Repeat this until chocolate is completely melted. Do not overcook or the chocolate may burn. Get a nice baking sheet and put a layer of wax paper over it to hold the strawberries after being dipped. 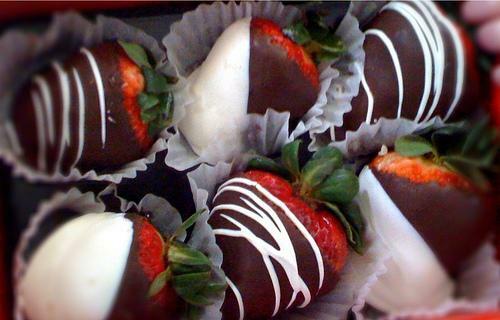 Hold the strawberry by the green stem and dip into the chocolate close wot the top of the berry. Take a teaspoon and scrap some excess chocolate off the bottom and them shake the berry gently several times to get off more excess. This will seal the chocolate on the berry and then place your berry on wax paper. Once you have completed all your berries, place the baking sheet in the refrigerator for about 15 min. Remove the baking sheet and then place all berries on a nice serving dish and place back in the refrigerator until ready to serve. Heat up some white chocolate in separate measuring cup and drizzle over or re-dip the berries for a neat look. Crush 4 oz. of walnuts or your favorite nut and roll your freshly dipped chocolate berry into it for a gourmet look. Take a nice colored plat and sprinkle powdered sugar from sugar shaker all over the plate before placing your freshly prepared Chocolate Covered Strawberries. To add more punch to your platter, dip some other fruits to add alongside the strawberries, such as blackberries, black cherries, dried apricots, etc. Makes about 24 strawberries. Can refrigerate unused chocolate and re-use.